Recently, my family was chomping on chunks of bread at Outback Steakhouse, a place we often go after I announce that I didn’t make it to the grocery store. …and instantly transported back in time. To the mid-1980s. To my own school formals. I went to Junior Prom with TB, a boy I had spent most of middle school trying to get to fall in love with notice me. Lord knows, we spent many afternoons in detention together as a result of misbehaving in French class. Before he moved to Philadelphia, however, I realized we were always going to be “just friends,” which was good enough for me. 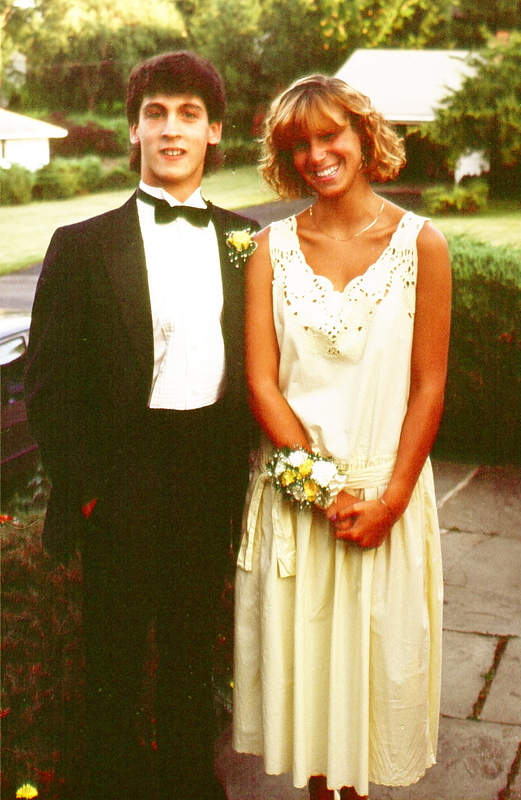 I sort of figured I’d never see him again, but he magically materialized to take me to prom. 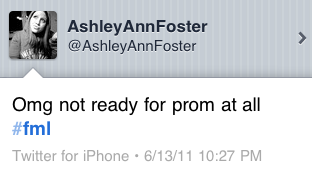 Here’s what I remember about that prom. First, let’s just establish TB looked awesome in his tux. Done. Okay, now let’s talk about my dress. Featured in Seventeen Magazine, my dress was a gauzy, white Gunne Sax for Jessica McClintock that covered me from chin to ankle; it had three layers of crinoline and 10,000 buttons up the back. I was hermetically sealed inside my dress. All I knew was that I felt like Madonna in that dress. Seriously, from the neck down, I totally looked like Madonna. Sadly, we must address things from the neck up. Just a few months prior, I had butchered my long mane and had not yet figured out quite what to do with what was – tragically – a long brush-cut. Or a lady-mullet. The in-between stage lasted for years. In an effort to try to make people not notice my heinous hair, I stuck an over-sized silver safety-pin through the extra hole in my left ear lobe. Because I was that stupid cool. I did not do a lot of primping for either prom. I mean, I showered. I was clean. People were freaking out. 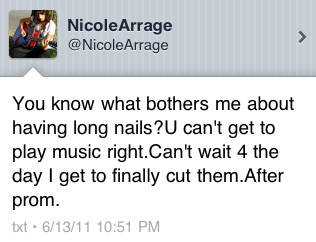 About shoes, about fingernails, about limos, about dress fittings. Dress fittings? Whaaaaat? I bought a dress and I put it on. As you can see, it fit. 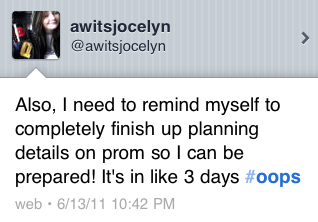 Unlike the tweeps, I did not worry about prom for days in advance. I do remember some mental anguish at both dances. Even though I wasn’t dating either guy, I still wanted the romance of the evening. I still wanted my dates to ask me to slow dance. Somewhere between 1986 and 2011, dress designers realized that high school girls did not want to look like Victorian dolls in ginormous hoop skirts nor did they want to look like mothers-of-the-bride. Thus, the prom dress industry was born. That night at Outback Steakhouse, the girls looked so beautiful; their dresses complemented their body shapes and each dress represented a stripe of the rainbow. Each young woman looked like a contestant from America’s Next Top Model. Each had a signature walk. Each looked so confident. For a minute, I felt envy. 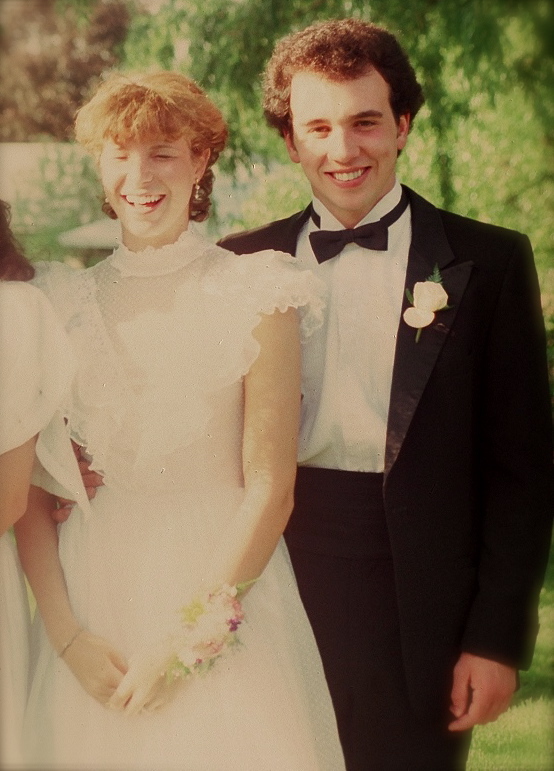 I mean, I was decidedly un-hot at junior prom and kind of potato-sacky at senior ball. But then I realized, to the outside world, I probably looked confident, too. Even with the bad hair. I found myself wondering about the girls at Outback – and all the girls who go to formal dances these days. They are so well-put together, so styled, so prepped. Outwardly, they appeared so mature. I wondered if they would be able to look back at themselves in 30 years with a sense of humor and recognize that they were also at a tipping point. Or had they already passed it? I imagine some things will never change about formal dances: the grown up feeling of getting dressed up and “going out on the town” without one’s parents; the freaky-deaky feeling a girl gets in her stomach as she sees her prom date pull into the driveway; those awkward posed moments where parents hover, taking zillions of photographs from every possible angle; the worry that a zit could erupt at any moment (and often did). I think of prom as that awkward place, a threshold between adolescence and adulthood where no one really knows what to do, so we just hold onto each other in our fancy clothes and spin around in circles for a little while. You know, up until I learned I had failed the Trig final.